Cate: Please welcome Maria Zannini. Maria, will you please share a short bio with us? Maria: I used to save the world from bad advertising, but now I spend my time wrangling zombie chickens, and fighting for a piece of the bed against dogs of epic proportions. Occasionally, I write novels. Cate: Sounds hazardous! At least the Chupacabra hasn't stalked you, lol. Tell us about TRUE BELIEVERS and where it's available. Rachel rattled the bone fragments in the palm of her hand then seeded them back to the ground. Her university would be pleased. She found exactly what they were looking for, but that wasn't the only reason she was here. The first shard, anonymously mailed to the University of Cairo, was ten thousand years old, and it matched the pieces found here precisely. But it was the rock drawings and dwellings that came as a shock. An ancient people lived here, and their writing spoke of Anu and his sons, progenitors of the Nephilim. She didn't like it when the humans got too close to the truth. Cate: You hooked me already. How do you develop your plots and characters? Maria: It starts with a logline and I ask three questions. Who are these people? What's at stake? And how can I make their problems 10 times worse? That and copious amounts of Coke Zero will usually do the trick. Maria: Only if I drink enough. By the time this post airs, the first round will have been over, but there are five rounds of elimination, so you'll get a chance to vote again next month. (Hopefully, I'll still be in the running.) If I am, stop by RT Reviews web site and cast your ballot for MISTRESS OF THE STONE. I thank you, my chickens thank you, and my dogs thank you. Woof! Cate: You have my vote. Any other published works? Maria: My first novel is called Touch Of Fire, a post apocalyptic romance set 1200 years in the future. Look for the sequel, Apocalypse Rising coming next year from Carina Press. Cate: Very cool. Describe your writing in three words. Cate: What’s the most challenging aspect of writing? Maria: I suppose that would have to be the annoying groans of starvation from my husband and two dogs. They know where the kitchen is. And while they're in there I could use a sandwich. Roast beast on wheat—don't forget the pickle. But do they ever make me lunch? Noooo. Cate, you can back me up on this. A working writer needs to eat regularly. We're too busy destroying fictional lives and dealing in multi-dollar contracts to do anything as menial as cooking or housework. Besides, it's not like my guys are doing anything important. The last time I saw them they were scrambling over a mountain of laundry, fighting over the last bag of Doritos. Cate: Food sometimes takes a back seat to writing, but always wins out in the end. Maria: "Maria! Does your mother know what you do for a living?" Maria: The other day I woke up to answer the door and found this hideous woman staring at me with these bloodshot eyes, drool running down her chin, and this rat's nest of wild hair. I rubbed my eyes because I knew I had to be seeing things. But no, there she was, plain as day. It was then I realized I was looking at the bathroom mirror. Cate: I don't believe it. I think a zombie chicken had you under its spell! Where can you be found on the web? Maria: Do you the government is keeping the existence of aliens secret? Or are there no aliens? Cate: Sounds exciting! Thanks so much for being my guest Maria. Thanks for letting me stop for some Halloween candy, Cate! I loved the zombie chicken picture you put in here. LOVED IT! When I'm in that writing zone, the thought of food doesn't even occur to me. It's amazing how the writing just takes over. As for your alien question, I vote No aliens. And Maria, I have a question for you ... Of the three books, do you have a favorite, one you feel closest to? My favorite book is always the one I'm working on next. Maria I'm definitely not answering that question, I can see that you, the aliens and the government are conspiring to make me sound like like i've lost the plot. So I am not going to say if they exist or not. On another note I do have a stash of food by my bed strictly for night time writing (it does wonders for the waistline). I definitely believe in aliens somewhere out there. 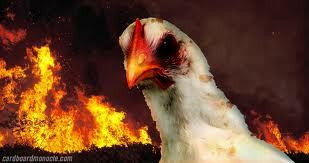 Thankfully, I don't believe in zombie chickens, cuz that pic is downright SCARY!!!!! Joanna: Drats! You've uncovered my sooper sekrit plan. I will give you credit for having writing snacks. You can write with me any time. Meghan: Zombie chicken exist. But they only eat chicken brains. I keep saying to myself "there are no aliens" but I may be wrong. So, okay, they might not be aliens, but they're pretty close.